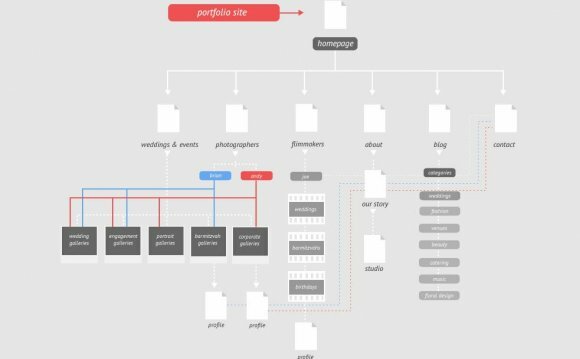 The site-map is often the first point in a design process, when all the research and considerations start to form into something tangible; something you can put in front of your client and say “this is the plan”. The site-map is the architecture, the frame, or at least the foundation, which defines how people see, navigate and experience a system of information, and functionality. So, I’m sure we can all agree, it’s worth getting this right. Site structures can be changed and updated over time, and this is undoubtedly a great opportunity to constantly respond to changing needs. It is important however to properly research and consider your site-map from the outset. To think about how your content will be grouped and categorised. There are a few potholes that can be easily avoided and some simple methods you can adopt to achieve a better site map from the start. Site maps simply reflect the organisational structure of a company. “About us” page, or for that matter, a “Site-map” page). The first example is extremely common; companies seem to think the best way to present their outward facing information is simply to mimic the departments, offices and production processes around which they work. This is hardly a very user-centered approach: can you imagine if the government did this? You probably can, because they used to, and it was hellish. As common as they might be; these habits aren't hard to avert. Making a better site map is quite simple: you start with a blank slate and no assumptions. By focusing on the unique habits and behaviours of an audience, and the unique goals of an organisation or business. You work out what content you need, and how it should be presented. The process of mapping content to goals simply involves research; developing a deep understanding of your client and what they want to achieve is essential. Interview key stakeholders to find out their values, what they want their website to do, and who they think should be visiting it (you should also try and asses what kind of workflow might be possible when it comes to producing and maintaining content). Carry out audience and market research, to find out who is actually engaging with the organisation, and what their website can really do. Perform an audit on any existing content, internally and externally. (Don’t restrict yourself to the current website).